Dermatoscopic image acquisition up to 18 mpx through Heine Delta 20T optic and reflex camera and the patented TRE T Medical wireless technology. It is the perfect combination between productivity and performances. Thanks to the gear of two 22’’ monitors, the system makes available to the specialist a wider and a more organised working ambient. The whole system is put together on a carriage with an adjustable height from 120 cm to 150 cm and can be used in a standing or sitting position. 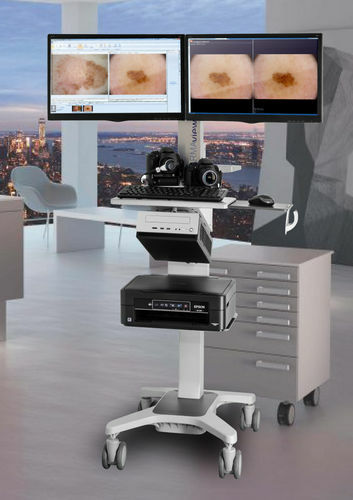 Dermaview DUAL provides the option of moving thanks to its slim shape, 4 wheels that can rotate up to 360° and the detachable power cord. Powerful incorporated PC Hardware, 1 TB data storage with possibility of exportation on CD/DVD, SD, USB.